⇨ Click Here for Current Specials Near You! Perfection Tire is your trusted expert for all your brake service needs. With our free brake system inspection, certified technicians check front and rear brake systems, fluid levels, and take special care to ensure your hydraulic and anti-lock brake system (ABS) is functioning safely. If your inspection reveals any necessary brake service, we’ve got you covered. From installation of new brake pads to a complete anti-lock system repair, Perfection offers premium brake service using top quality parts with competitive pricing. A sound suspension and correct wheel alignment are important for extending the life of your tires, improving fuel economy, and ensuring optimal vehicle performance. At Perfection Tire our certified technicians perform a comprehensive safety inspection of your suspension system, and with state of the art computerized wheel alignment technology we provide you with the most accurate all-wheel alignment available. When you run into an unexpected problem with your vehicle, Perfection can get you back on the road with minimal stress and worry. We use the latest in computerized diagnostics to accurately diagnose and repair your vehicle. 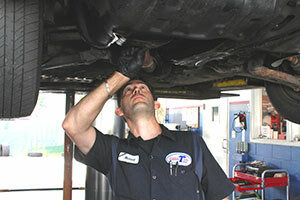 Our team of certified technicians can handle the toughest of jobs. Manufacturer scheduled maintenance is vital to keeping your car running problem free now and down the road. Perfection can help you stay on schedule with manufacturer recommended maintenance and extend the life of your vehicle. Our certified technicians perform services such as fluid replacement, component inspections, tire rotations, and tune-ups. This preventative maintenance will keep your vehicle safe and running at optimum performance.